U.S. Women's Soccer Team Cannot Go On Strike, Court Rules : The Two-Way The federal ruling removes the possibility that the American women might refuse to play in this summer's Rio Olympics as part of the maneuvering over their union contract. 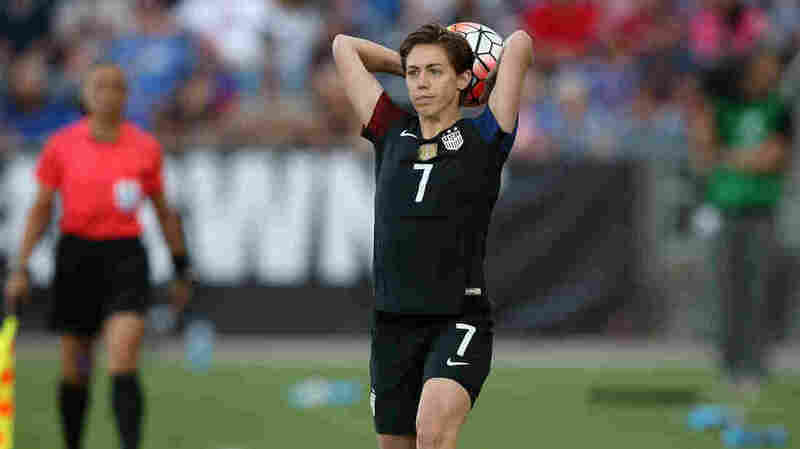 The U.S. women's national team — including Meghan Klingenberg, seen here in a game Thursday — doesn't have an option to strike, a federal judge says. Affirming the status of a collective bargaining agreement, a federal judge sided with U.S. Soccer on Friday, ruling that players on the women's national team are prohibited from going on strike by their collective bargaining agreement. The case is separate from a federal complaint by several high-profile players filed against U.S. Soccer in March, when they accused the federation of wage bias. The status of the players' labor agreement had been in dispute: It expired at the end of 2012 but was extended by a memorandum of understanding that the players association had recently threatened to end if "significant progress" wasn't made in talks for a new contract. Judge Sharon Johnson Coleman's ruling in Illinois' Northern District removes the possibility that the American women might refuse to play in this summer's Rio Olympics as part of the maneuvering over their union contract. The specter of a work stoppage led U.S. Soccer to file a complaint in early February, seeking a court order to prevent a potential strike. As a result, the players will now continue to operate under the terms of a CBA that dates to 2005. The federal wage case that was filed by several star players — including Carli Lloyd, Hope Solo, and Alex Morgan — centers on a complaint with the Equal Employment Opportunity Commission that accuses U.S. Soccer of paying the reigning World Cup champions far less than it does their male counterparts. The U.S. women's national team will begin its Olympics campaign in Brazil on Aug. 3, facing off against New Zealand.